One of the big perks of vacationing at a resort is not having to deal with food prep and planning. No groceries, cooking, or dishes. None of the searching for restaurants and scavenging for snacks that happens when you forego resort dining. But then again, you might be a bit concerned about the kind of fare that comes with those “all-inclusive” packages. Will it be fresh and seasonal? Will my kids find something they like? How about my food preferences? What if I want a special culinary experience I can’t get anywhere else? Luckily, opting for convenience by staying at a resort doesn’t have to mean settling for drab fare. Plenty of Ontario resorts offer top-notch eats and one-of-a-kind dining experiences. It just takes a bit of poking around to find them. That’s why we’ve put together a list of fail-proof choices that includes something for everyone. Fine country cuisine done right. The staff at Killarney Lodge are used to guests asking for their kitchen’s recipes, as were the staff before them, and so on, as the resort has been preparing delicious meals for over 75 years. Offering three meals per day, and three choices for each—often a meat, fish, and vegetarian option—Killarney Lodge also allows visitors to bring their own wine (no corkage fee!). While we recommend you try as many of the menu items as you can—fresh trout, homemade lasagna, rack of lamb, roast chicken, and decadent baked goods among them—what you really need to try is their packed picnic lunch. If you’re off to Algonquin Park for the day, you don’t need to hurry back to the resort in time for lunch. By request (ask the night before), you can have a picnic lunch arranged for you before you hit the trails. Expect hearty, high-quality selections, large portions, and home-baked goods—no trail mix or canned beans on this hike. Their fresh baked breads and pastries are second to none, and their well-thought out touches are hard to miss: Niagara peach chutney, focaccia croutons, and truffle mash come to mind. But not to worry—a glorious, classic prime rib is also on offer, if you know what you like and like to go the more traditional route. Inside The Waring House you’ll find The Barley Room, a Prince Edward hot spot renowned for its warmth, friendly staff, and satisfying meals. But that’s not all—The Barley Room is more than a pub in the strict sense—they also host a variety of events, including five nights of live music each week, games and trivia, and their infamous East Coast style “kitchen parties”—you never know what you’ll find at this open mic. But it all comes back to the food. Imagine your typical pub fare, then bring it up ten notches. If you visit in summer, the vegetables you’re eating are likely to have been harvested that morning. Your burger is made from beef that was ground in-house, their signature apple and cheddar soup uses Country Cider, produced on a local farm, and that beer-battered fish ‘n’ chips uses the Barley Days, a beer from a nearby craft brewery (which happens to have also been the first in the county). Fish tacos are a great choice if you’re in the mood for something light, and the build-your-own mac and cheese is, well, not light, but so very satisfying. In addition to their impressive food menu, The Barley Room has sixteen taps and an impressive malt list to choose from. Plan to visit more than once. 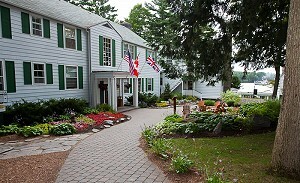 You’ve escaped to Muskoka and The Sherwood Inn is, above all else, an authentic Muskoka experience. Waterfront cottages, check; Lake Joseph sparkling in the sun, check; and waking up to the smell of those old, tall pines—you’ve arrived. Not every charming lakeside stay is going to add up when it comes to the culinary side of things, but The Vintages Dining Room will. It’s got what the rest of the resort has going for it: authenticity. This is Muskoka. What exactly does this entail? Breakfasts include Muskoka maple syrup, pickerel and trout are caught locally, and the cheese curds on the poutine come from Thornloe Cheese. The Vintages Dining Room is all about the homemade: gnocchi is made fresh, salmon and turkey are smoked in house, and wild leeks are foraged right there—there’s even a video about it! Leave room for dessert, because the Cranberry Lemon Meringue Pie is a Sherwood Inn signature classic, one you won’t want to miss. When The Beachwood Resort began as a fishing camp back in the 1920s, no one could have guessed what it would flourish into. Today you’ll find lodge, condo, and cottage accommodations, everything you’d want in a country getaway (trails, forest, wildlife) with the comforts of home (high speed wireless internet) and then some (lakeside saltwater pool). 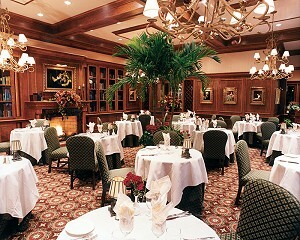 And then you have Frederick’s—the on-site restaurant open to both resort-goers and the public. The menu already comes marked with vegetarian, gluten-free, and dairy-free options, but there’s more. Having experience with The Canadian Society of Nutritional Managers means Chef Michael Henson is up to the challenge of meeting your dietary requirements, whatever they may be. Call ahead to inquire, and make sure your resort dining experience fits not just your wants but your needs. 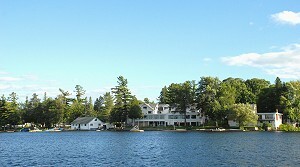 The Bayview Wildwood Resort is a favourite family destination and has been for over a century. (Which is not to say it’s not also popular for golf, girls’ getaways, and so on…) A range of sports, planned daily activities, and a supervised children’s program (!) is not all that makes it so—there’s also Echo’s Dining Lounge. Now, this upscale casual establishment may not exactly scream “kid food” but that’s what makes it all the more appealing. First of all, this is your vacation too—and the pasta, meat, chicken, and fish options are all high-quality, expertly prepared, and melt-in-your-mouth delicious (as are the soups, salads, desserts, and really everything else on the menu!). Thinking of the kids means thinking of the parents, because no kid (or nearby adult) wants a “hangry” parent around. But you also want good dining options for the kids, and this is where Echo’s really shines. If your kid is a pasta-and-tomato-sauce purist, the kids’ menu has you covered. Through the busy summer months—as well as Christmas and March breaks—children can check out the buffet during meal times—no waiting required. And here’s what we think is the best option of all: “kid-sizing” the adult menu items. So, if you have one of these prosciutto-wrapped-cantaloupe type of eater on your hands, they’ll be happy too! At the all-inclusive Fern Resort, get a taste of history at Heritage Dining Room. The first generation of this family to own the resort, Jim and Mimi Pettapiece, brought with them a recipe for home-baked rolls, served for four generations with Crerar’s Honey (another family-owned Ontario operation). Did we mention that was in 1918? You’re not going to find a 100-year-old family recipe just anywhere. Blue Mountain Resort is a large-scale operation and their dining options are in a league of their own: here you can pick from over a dozen of your favourite chains, whether you’re looking for all-day breakfast (Sunset Grill), customizable frozen yogurt creations (Menchies), or casual upscale dining (Oliver & Bonacini), to name just a few options. White Oaks Resort’s focus is on local foods and health-conscious dining options. Their trio of eateries—Liv, Play, and Grow—showcase and plate these in distinct settings: refined, casual, and café, respectively. 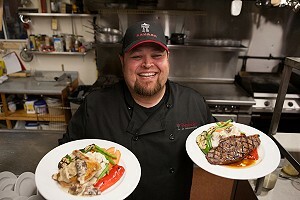 Headwaters Restaurant at The Millcroft Inn describes its fare as “French classical cuisine with a country flair.” Private dining options, local ingredients, and live music on Saturdays are all part of the appeal. But it is their claim that their food is “thoughtfully prepared with love and an abundance of butter” that captured our hearts and stomachs. Oh, and you’ll be dining by a waterfall—in case you weren’t charmed enough. Many who vacation in Ontario think first of the Muskoka area, and for good reason. The Lumina Resort’s dining room overlooks the stunning Lake of Bays, but their shore breakfast is unparalleled. At an additional cost, your breakfast can be prepared on the resort’s own private island, over an open fire. Rustic was never so charming. Of course, you might be an incurable traditionalist who finds even the concept of “culinary experience” a bit too fussy. But have no fear. Ontario resorts won’t let you down. The classic resort experience of barbequing in front of your own private cottage or letting the kids make as many S’mores as they want is always—and always will be—an option. So #GOResorting. And don’t forget to bring your appetite. Because resorts are about more than just relaxing and having fun—though they’re definitely about that too. These days, they’re also all about making meal-time special. From the simple and unpretentious to the indulgent and foodie, Ontario resorts have a menu for everyone. Treat yourself or treat a loved one. Resorts of Ontario has gift certificates for that special occasion—wedding, thank you, Father’s Day, anniversary. These gift certificates are like having cash in your wallet with no expiry date and can be used for all sorts of resort services and experiences—including, of course, dining.